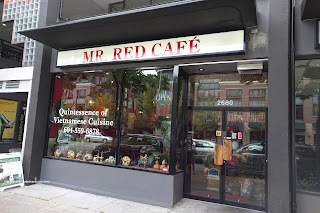 I would say that of all the neighbourhoods in the Vancouver proper, Kits is one of those places I never think of traveling to eat unless there was some planned in advance. It probably correlates with the fact I don't drive towards and away from UBC very often. However, Grace needed to head out there to get a dog carrier and I tagged along knowing there would be eats in the future. 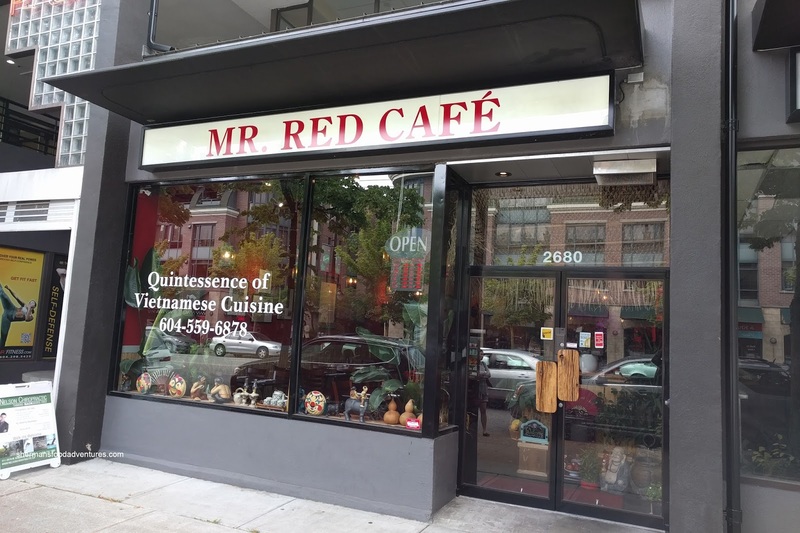 We stopped by one of the few spots that serve North Vietnamese eats in the Broadway location of the popular Mr. Red. At Grace's suggestion, we had the Bánh Bột Lọc Lá Chuối or steamed pork & shrimp tapioca dumplings wrapped in banana leaves. 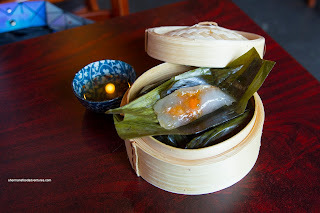 These were on point with buttery soft tapioca and tender pork that had an appealing rebound texture. It was well-seasoned where the salty brininess of the shrimp came through. The accompanying fish sauce dip added another layer of saltiness as well. 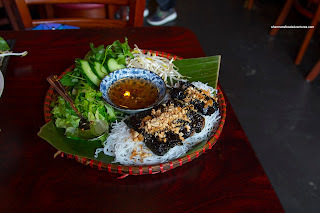 My choice of dish was the Xôi Xéo Hà Nội or sticky rice with mung bean and fried shallots. 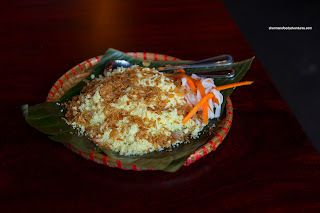 As simple of a dish this might be, I loved the soft glutinous rice topped with crumbled mung bean and aromatic crispy shallots. For me at least, adding some of the chili garlic vinegar made the dish sing. 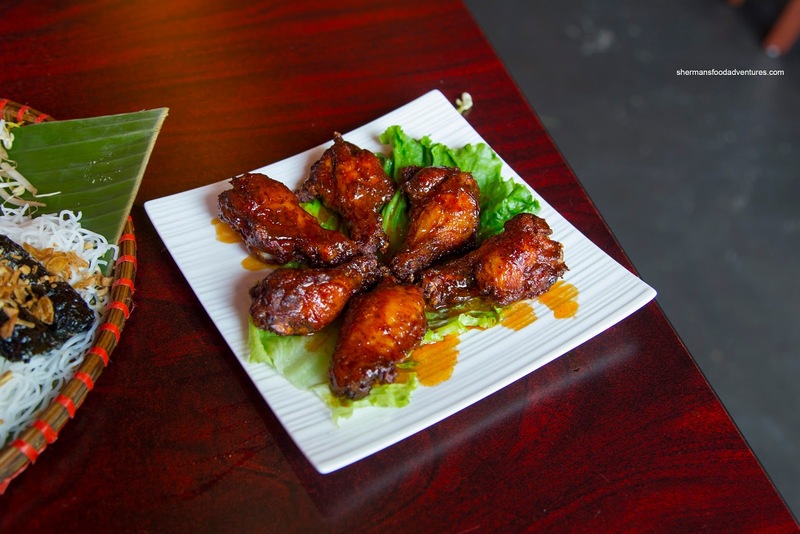 Another appie of sorts was the Cánh Gà Chiên Mật Ong or spicy fried chicken wings with honey and butter. Despite the seemingly wet appearance, the wings were actually really crispy and not soggy at all. There was impactful flavours to be had including an initial hit of sweetness then tempered by a muted spiciness. 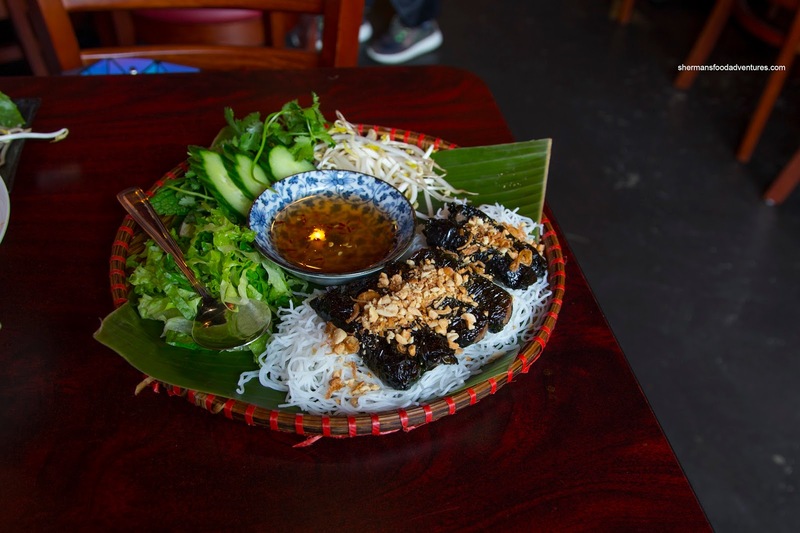 Onto a larger item, we had the Bun Bò Lá Lốt or grilled beef wrapped in betel leaves served with vermicelli, cucumber, sprouts, cilantro and mint. This was our favourite dish of the meal since it was both impactful and texturally on point. I liked how the beef was juicy and tender with a rebound while naturally sweet and seasoned with fish sauce. 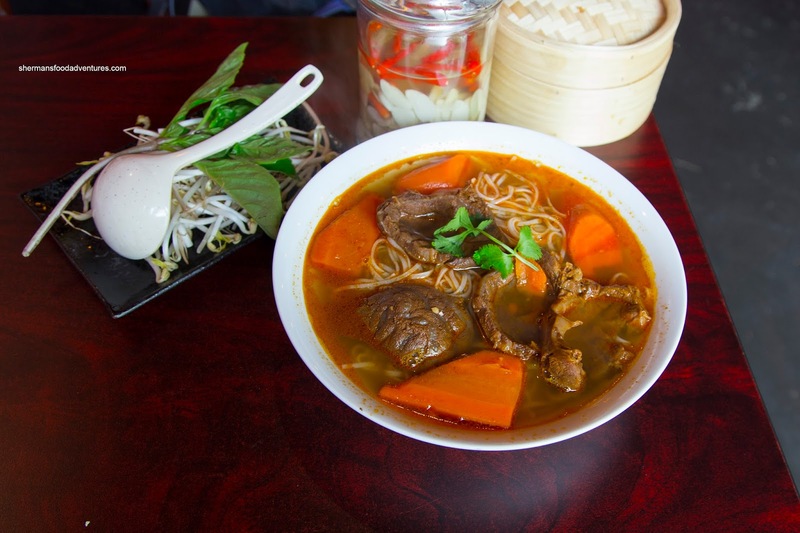 Our last item was the Phở Sốt Vang Hà Nội or Hanoi Beef Stew Noodle Soup. I found the taste to be subtle yet still meaty and flavourful at the same time. There was a rich beef quality to the broth while the anise, cloves and cinnamon were totally detectable. The slices of beef shank were tender while not becoming over soft from the braise. Slippery and chewy, the rice noodles were on point as well. So as you can clearly see, we enjoyed our meal where the food was on point and delicious. It's nice to see the Broadway location has kept the consistency of the original one on Hastings. Their bánh xèo - crispy pancake, is one of the best versions of that dish that I have tried. Unfortunately, it's one of the items that is not available at their Hastings St location.